Indigenous language publishing in Africa started with Christian missionaries, and in part by Islamic clerics. 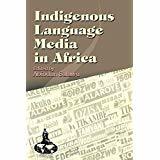 The socio-political and economic changes since then have greatly affected indigenous language media. Here, twenty scholars examine aspects of those changes; they are from Nigeria, Uganda, Malawi, Cameroon, Kenya and Congo; with contributions also from USA and UK. Future prospects are explored, and the possibilities for improving the prospects of the genre. Covering the written word and the broadcast media, the work is a pioneering documentation of a neglected subject of academic study.